There are still openings available for the Canvas Overview Sessions. Get an introduction to the proposed new Learning Management System. You can find those and many more in the Directory of Open Access Journals. Learning Objectives are a key part of any curriculum. If you have ever taught a course, chances are you have written a learning objective or two. However, writing learning objectives can be considered a challenge. The good news is that there are tools online that educators can use to help themselves write learning objectives. One of these tools is called The Differentiator. 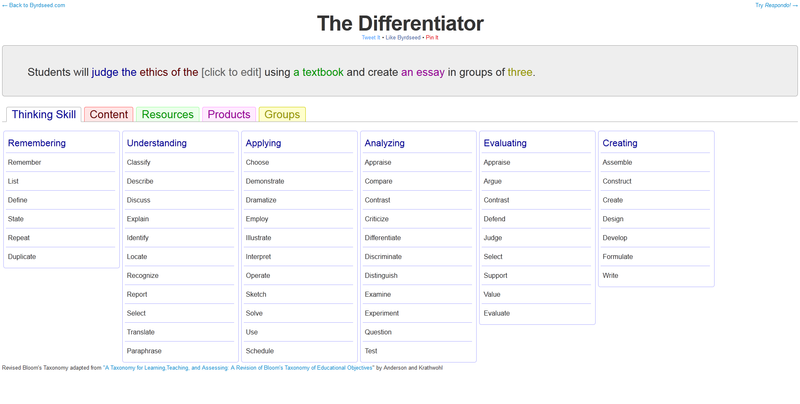 The Differentiator is a great tool that can help you write strong learning objectives. Its friendly interface and easy to understand layout is great for anyone who may need that extra boost in the right direction. You can click the link below to try it out yourself! As Massive Open Online Courses (MOOCs) proliferate, feedback is coming in from faculty and students. A recent article in the Chronicle of Higher Education discusses the incidence of plagiarism in some of these courses. What surprises me is that people seem surprised that there would be cheating.